Movie Review: 'Greetings From Tim Buckley,' Directed By Daniel Algrant The singer-songwriter and the son who's desperate to escape his legacy are the subjects of Daniel Algrant's sympathetic if simplistic biographical drama. 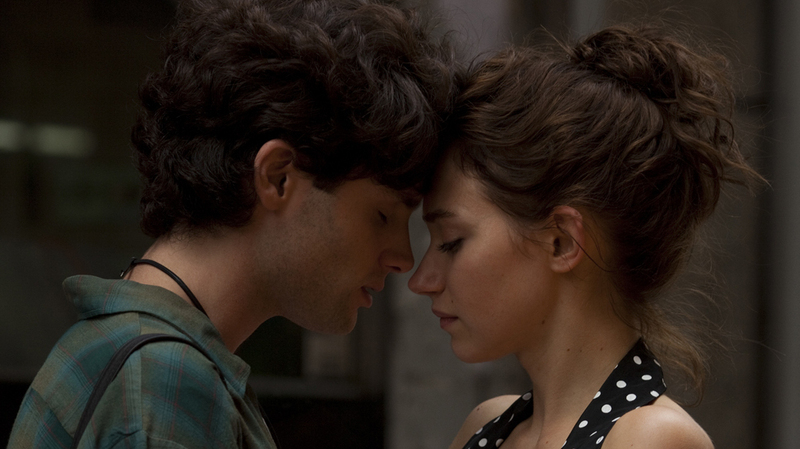 Jeff Buckley, played by Penn Badgley, and Allie, played by Imogen Poots, share a romantic moment in Greetings from Tim Buckley. Today, the younger Buckley is remembered as a brilliant musician who died a tragic, early death, but early in his life, he was overshadowed by his father, Tim — a musician who also died young. With: Penn Badgley, Imogen Poots, Ben Rosenfield, William Sadler, Norbert Leo Butz, Kate Nash. Pop-culture deaths, especially when they come at an early age, have a tendency to turn human beings into instant icons, embalming them in the mythology of lyrics, performances, photos, quotations — and suicide notes where applicable. When Jeff Buckley, the supremely gifted singer-songwriter, drowned in May 1997 — at age 30, only one record (the towering Grace) into a career flush with promise — the details made it sound like a death staged by a rock hagiographer. Leaping fully clothed into the Wolf River in Memphis, where he was preparing to work on his follow-up album, Buckley was swept up in the wake of a passing boat and disappeared into the night. It was as if this sensitive soul was too fragile and precious to stay on this earth for long. Or so goes the narrative, anyway. If nothing else, Greetings from Tim Buckley, a thoughtful biopic about the musician's coming to terms with his absent father, takes more interest in Jeff Buckley the man than in Jeff Buckley the myth. There are overlaps between the two, of course, including some of the heedless spontaneity that cost him his life, yet the Buckley that emerges here isn't the sainted martyr with the golden voice but a lonely, temperamental, at times deeply narcissistic young man who cannot escape from his father's legacy. The faster he tries to run away, the more eerily doomed he seems to repeat it. Director Dan Algrant and co-writers David Brendel and Emma Sheanshang smartly frame the action three years before Buckley released Grace and even before the singer grew a minor cult following as a cover act in various clubs around Manhattan's East Village. A still-unknown quantity, Buckley (Gossip Girl's Penn Badgley, in an uncanny performance) gets summoned to participate in a tribute concert to his father, Tim, another singer-songwriter who died young; despite having encountered his father only twice in his life, Buckley agrees to do it, but inevitably he'll have to confront a deep-seated emotional pain that still throbs persistently. Greetings from Tim Buckley heads down parallel tracks, comparing and contrasting the younger Buckley's heartache in Manhattan — which reveals itself in a romance with a concert worker (Imogen Poots) — with flashbacks of his equally handsome and talented father (Ben Rosenfield) on the road, drifting from bed to bed while Jeff's mother takes care of him. One of the elder Buckley's bandmates (William Sadler) tells the younger that his dad used to slip into junior's room at night and watch him sleep in his crib, but it's cold comfort for a young man still simmering with resentment. The strongest scene in Greetings from Tim Buckley finds Jeff in a record store, picking through old vinyl while singing his own private tune, his quivering voice moving up and down the register at higher and higher volume. The more he sings, the less conscious he becomes of his surroundings: It's a spectacle at once beautiful, inspiring, embarrassing and vain, and it encapsulates everything noble and regressive about a man who lived without a filter. Though Algrant has a good feel for the vagaries of musical collaboration — the behind-the-scenes glimpses of the Tim Buckley tribute are among the film's most credible moments — Greetings from Tim Buckley wallows so thoroughly in its daddy issues that it ultimately lacks much dimension. Algrant establishes early and often that Jeff isn't much different than the father who abandoned him, which gives most of the flashback scenes a grinding redundancy. What redeems the film, ultimately, are Jeff's poignant efforts to unburden himself of his father's oppressive legacy and stand on his own merits. He boasts early on that he knew from a young age that he had more talent than his dad — the gorgeous soundtrack suggests that's vanity talking — but either way he can perform any one of the old man's songs by heart. Sometimes his father's music is the only thing he's capable of hearing.